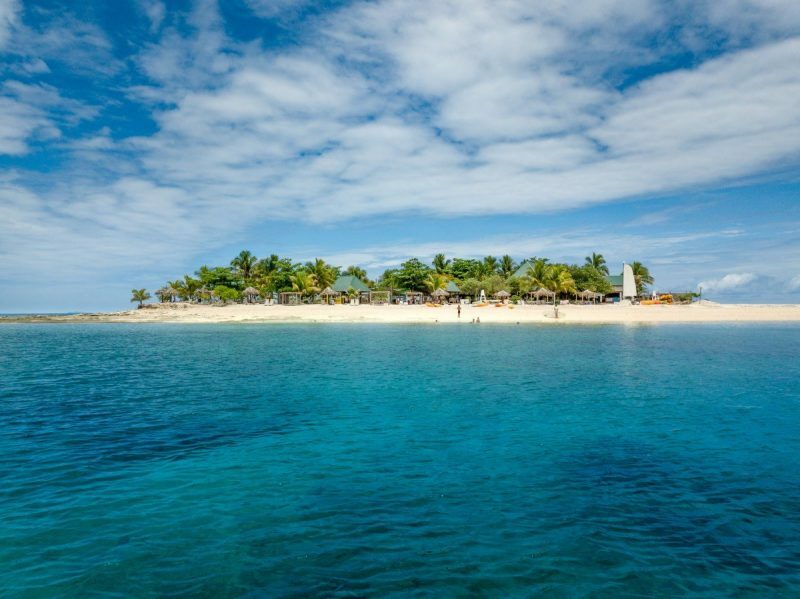 Fiji conjures up images of a tropical paradise – tiny coconut fringed islands, crystal clear water and white sandy beaches. 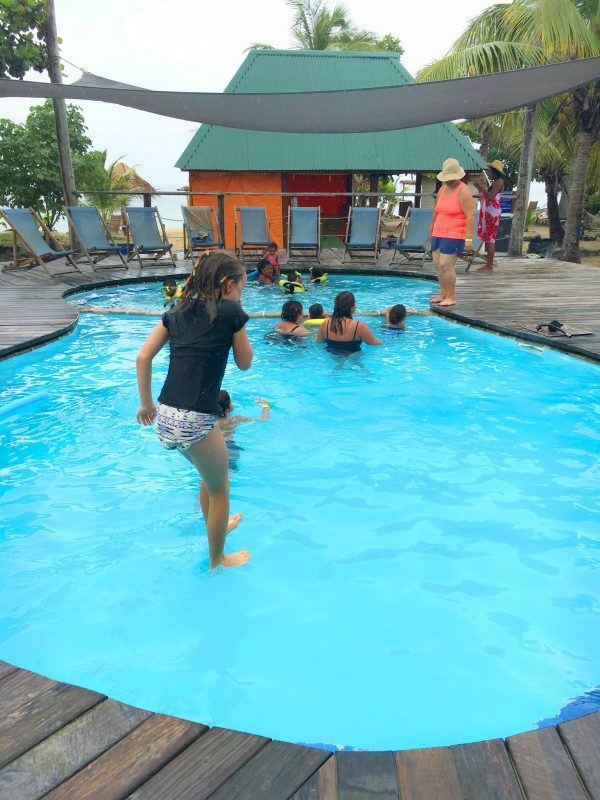 Well, the reality is if you’re looking to stay at a fully-equipped resort with all the mod-cons on a family-friendly budget, then your main options are at one of the large hotels on the mainland at Denarau Island like we were, or the Coral Coast. So a great way to experience what it’s like to be in that tropical paradise is to take a day trip out to one of the islands. 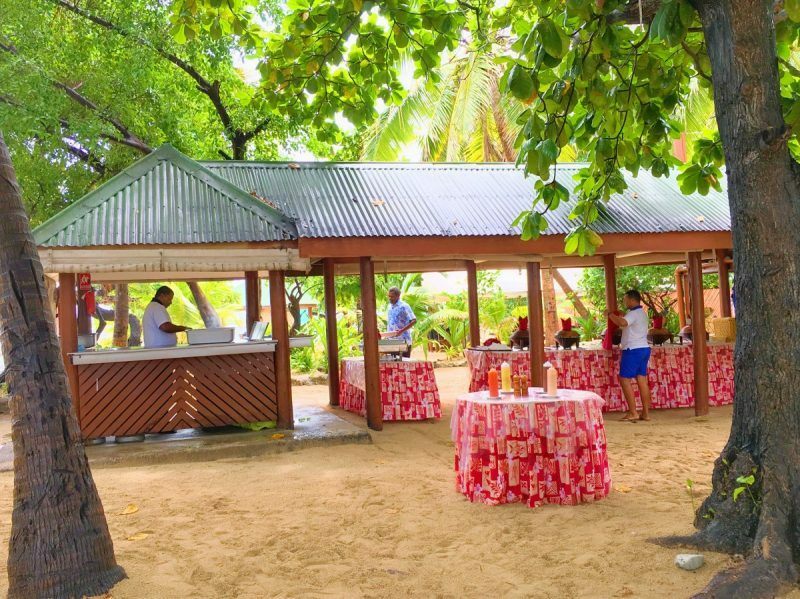 We had a great time visiting South Sea Island, with South Sea Cruises. 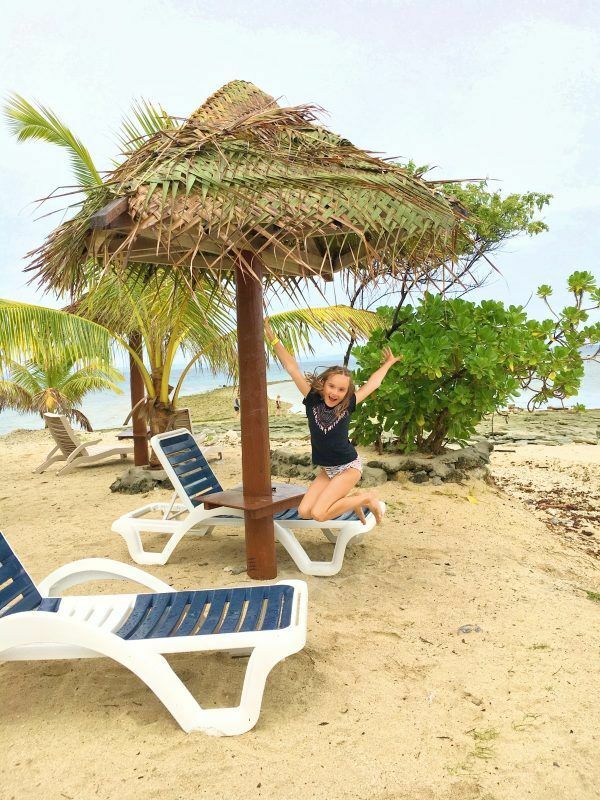 It’s located in the Mamanuca Islands group and located around a 30-minute boat ride from Denarau Marina – just the right amount of time to be on a boat with kids! 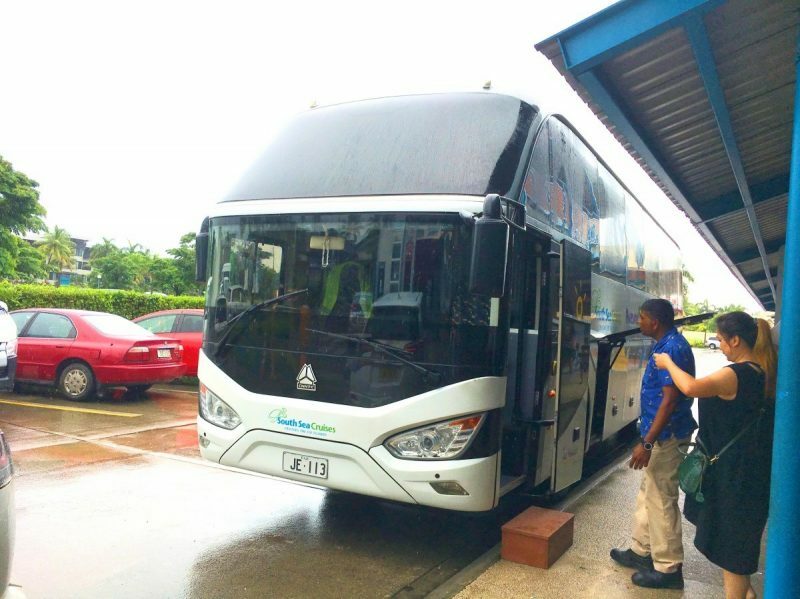 We were picked up from our hotel promptly at 9.15am and transported on a modern air-conditioned bus down to Denarau Marina. 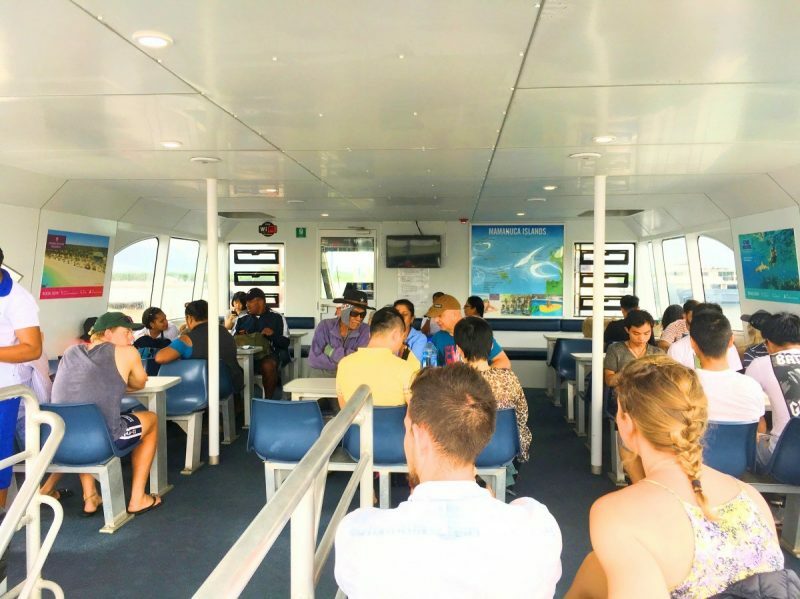 Once there, we checked in and were able to board the catamaran that would take us to South Sea Island. 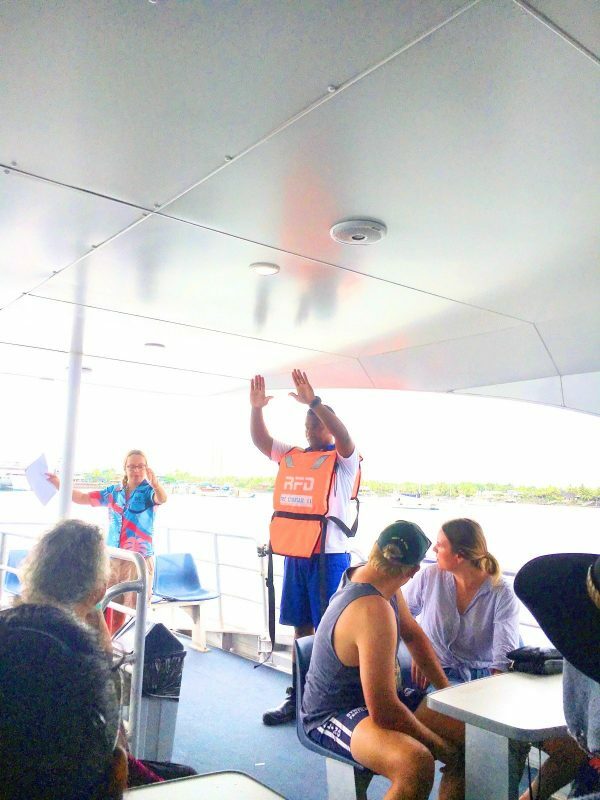 Before setting off, we were given a full safety briefing and demonstration of putting on the lifejacket, which was really great to see – it made us feel very safe compared to some of the ferries we’ve travelled on in recent years! Once everyone was on board, we headed out of the marina. First it was a brief stop at Malamala Beach Club to let most of the passengers off. From there it was a short trip over to South Sea Island. South Sea Island doesn’t have a jetty, but it’s no problem as a small tender boat comes out to the catamaran to pick you up and take you safely to the beach. The island itself is very small – you can walk around it in 5 minutes, longer if you’re beachcombing! We headed straight up to the main building to find somewhere to put our stuff, before exploring the island. 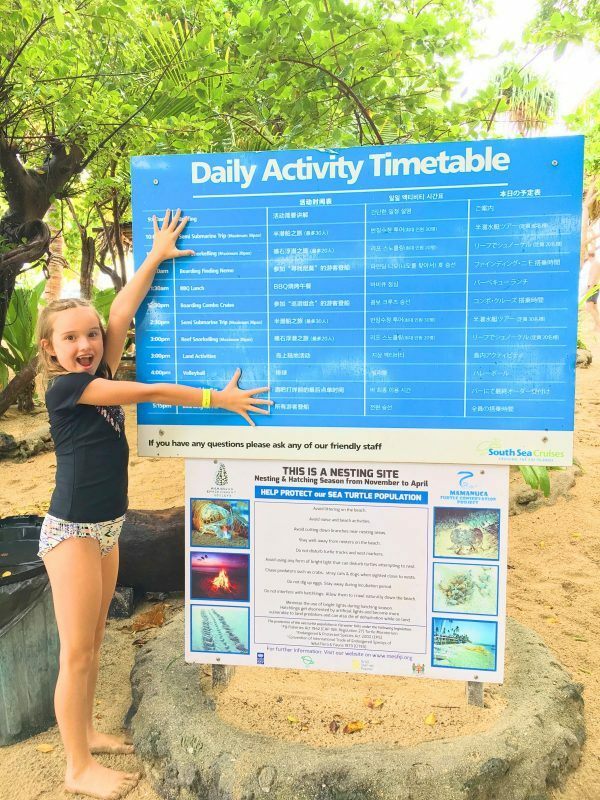 An ideal first place to visit is the timetable board, which gives details of all the different activities available on the island and the times they take place. 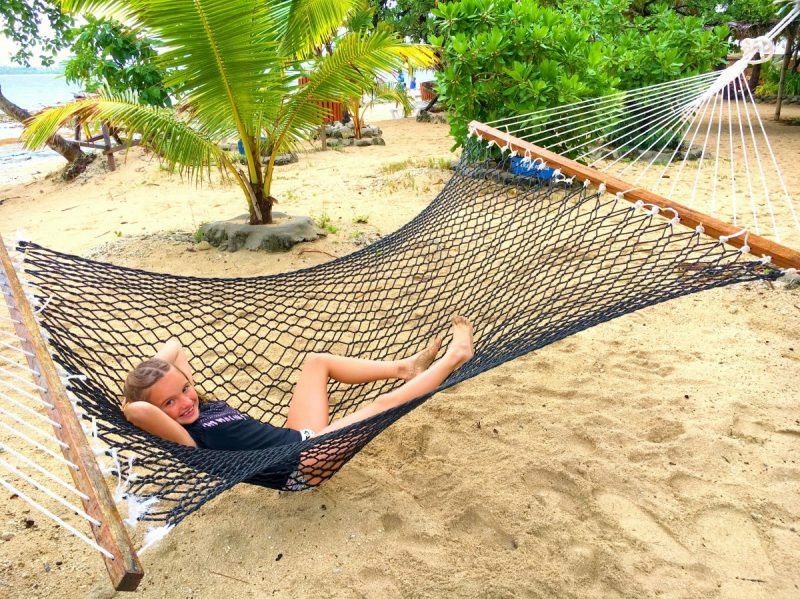 …or find one of the hammocks dotted around the place. 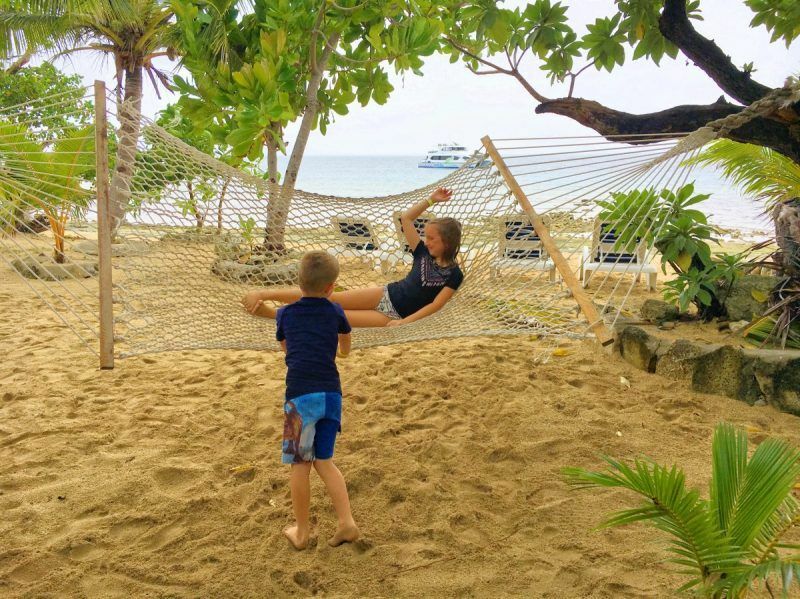 Our kids loved swinging each other in the hammock! 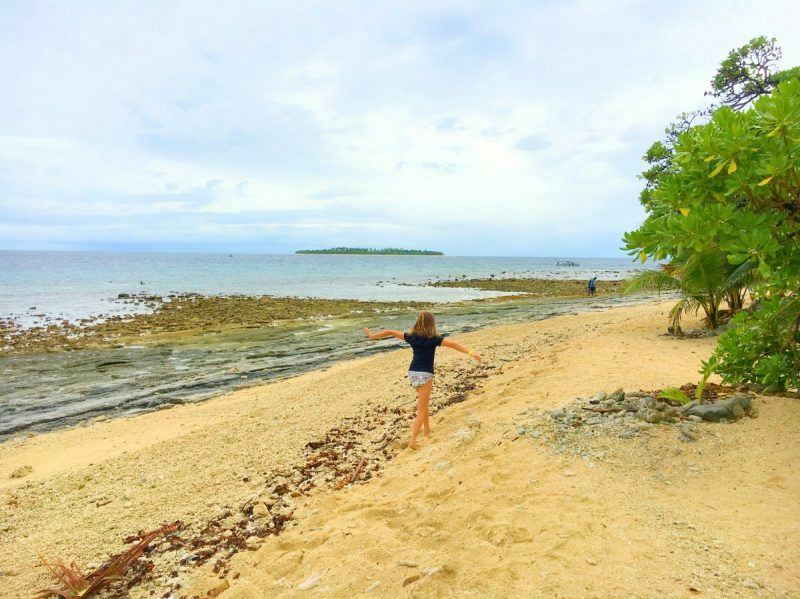 Our kids also LOVED beachcombing – exploring the coral and shells on the beach and spotting crabs in the rockpools of the island. A small massage hut is also on the island where you can book in for a relaxing 30 minute or hour-long massage for an additional cost. 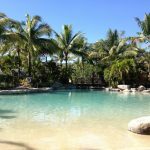 If you want something a bit more active, then there’s a great salt water pool with a shallow end and 1.8m depth more suited to adults. 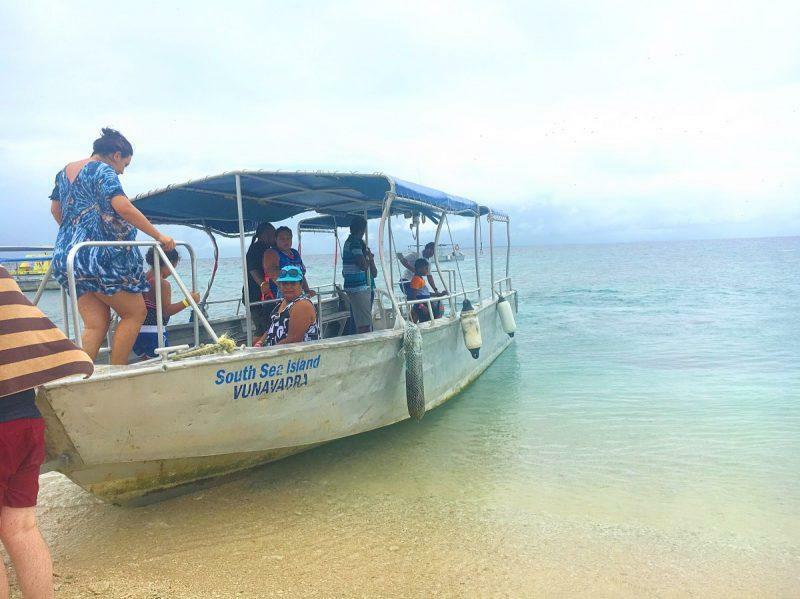 Snorkelling gear is included in the cost, and the island is surrounded by a coral reef so there’s plenty of opportunities to see beautiful coloured fish, stingrays and coral. 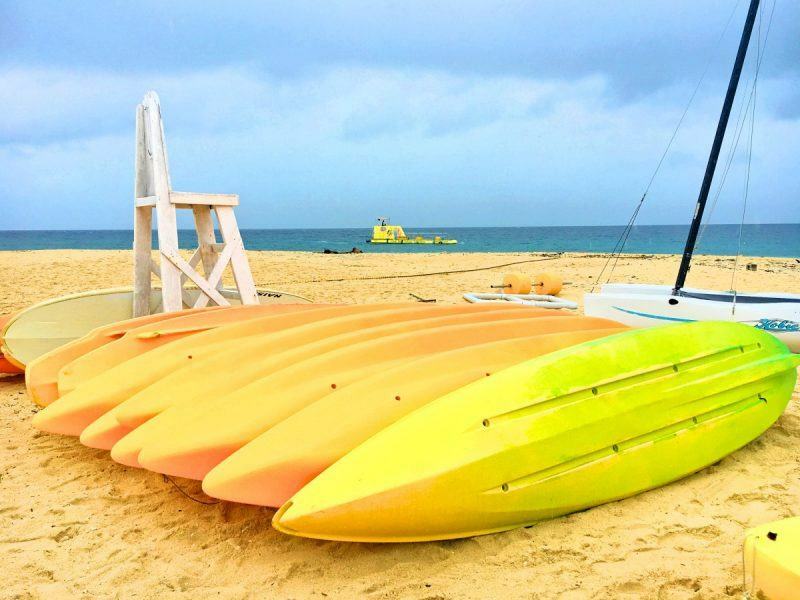 If heading out on top of the ocean is more your thing, there are plenty of kayaks and stand up paddleboards available. Finally, there’s also a kids club available if you’d prefer to leave the little ones while you relax. Because the weather was not great the day we visited there didn’t seem to be much happening at the kids club, so we stuck to the main pool. Just before 12pm, we were served a beautiful barbeque lunch with lots of salads which was a welcome change from our staple burger and fries resort menu of the previous few days! 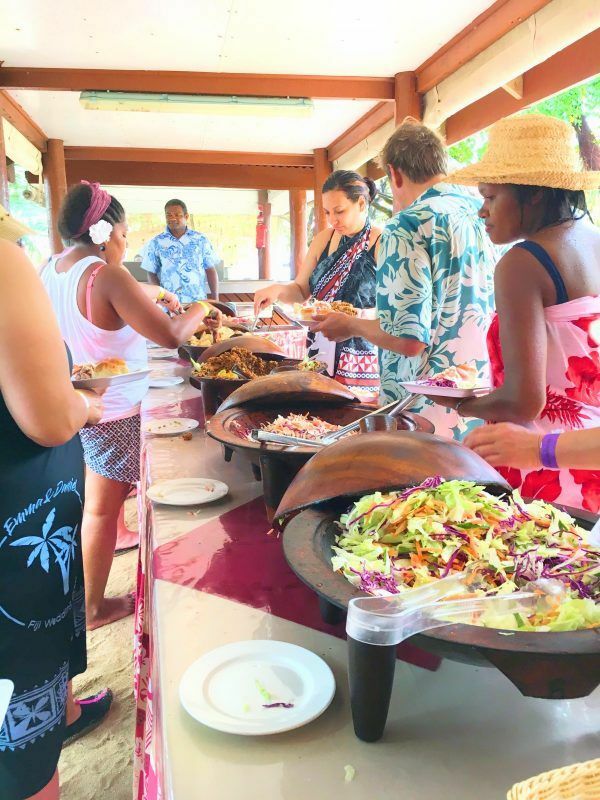 We all enjoyed eating the coleslaw, green salad, rice salad, potato salad, fresh bread rolls, and a meat selection of BBQ steak, chicken, fish and sausages – and the most amazing fruit salad of watermelon, pineapple and apple. There was plenty of food to go around! Our kids loved the food at South Sea Island! 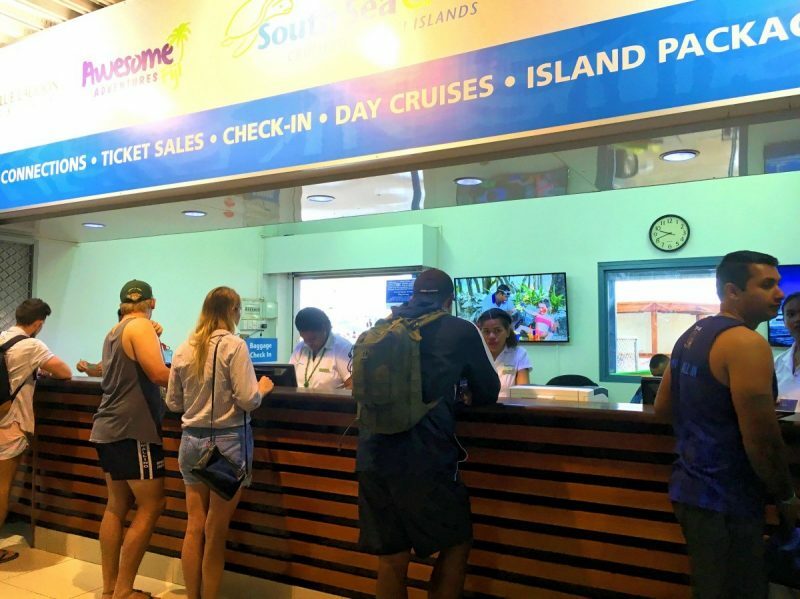 South Sea cruises also check if there are any dietary requirements before you head out on your day trip and it appeared that vegetarians and gluten-free diets are well-catered for. The bar also sells ice-creams and snacks for an additional charge if you need a top up. 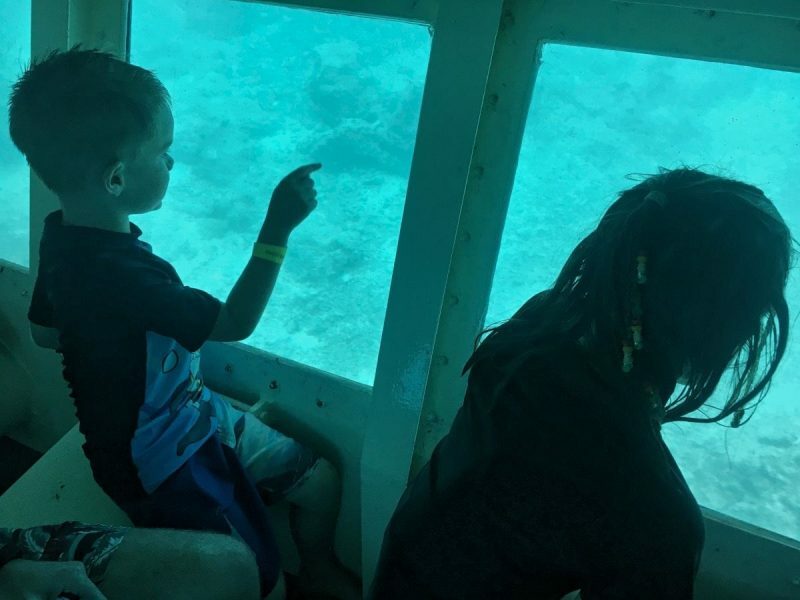 Next up was the activity our kids were most excited about – exploring the coral reefs aboard a real-life submarine! 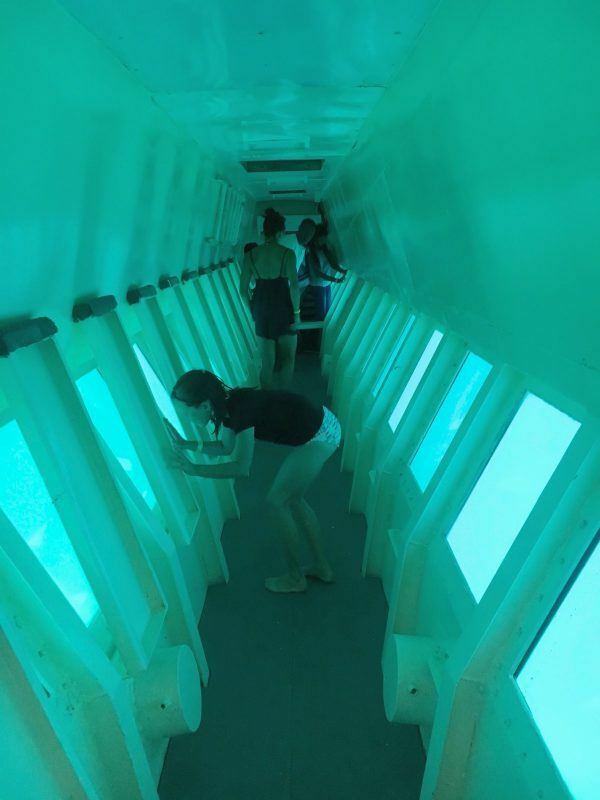 It was all aboard the tender boat which took us out to board the semi-submersible glass-bottomed boat. During the half hour trip, we saw hundreds of brightly coloured and striped fish, plenty of beautiful coral of many shapes and sizes, the most vivid blue starfish, and a couple of stingrays which made our six year old literally squeal with delight when he saw them! He’s since come back to dry land and spent many hours drawing a recreation of what he saw underwater! Due to the inclement weather and large waves, there wasn’t the option to go for guided snorkelling out on the reef in the afternoon. But not to worry, we had a very interesting lesson all about coconuts and their usage. 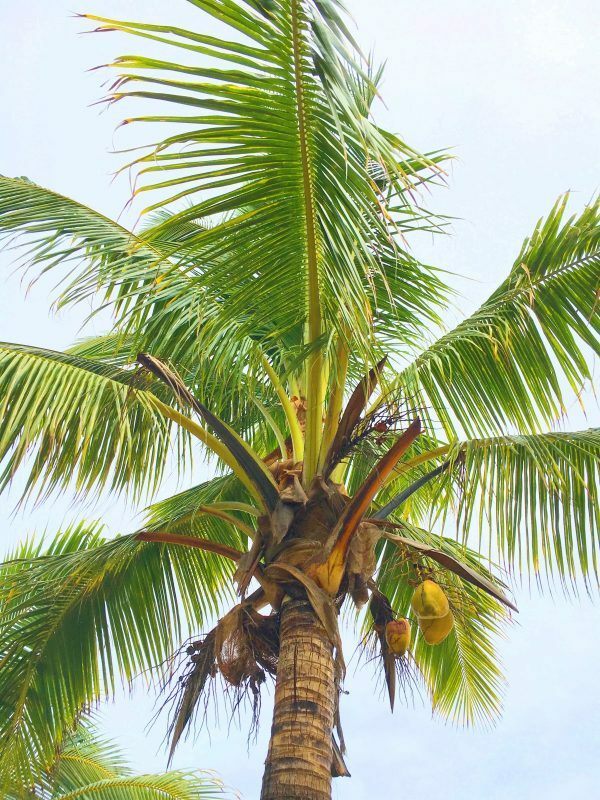 It’s absolutely amazing how this humble tree is used in so many ways – literally shoot to root including, food, drink, shelter, bowls for eating, coconut liquor, coconut sweets and the difference between green and brown coconuts. We also saw an amazing demonstration of the best way to open a coconut and grate it – which will come in very handy next time I whip up one of the curries I learnt to make in India! 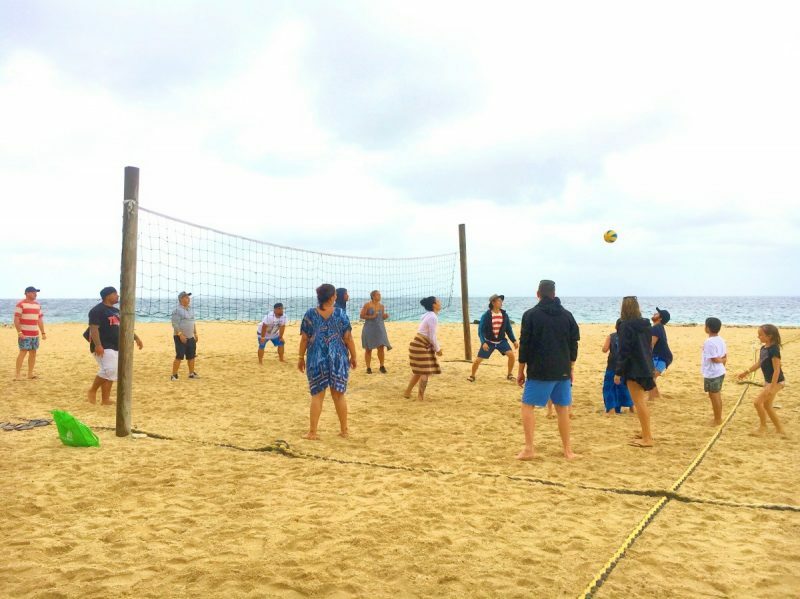 To end the day we took part in a really fun game of beach volleyball. Lots of kids also came into the game and it was a really fun, good-natured game where they all got praise for their efforts. All too soon it was time to pack up our things and head back to the mainland. By this stage the wind and waves had really got up, so it was certainly an adventure getting back out to the catamaran! 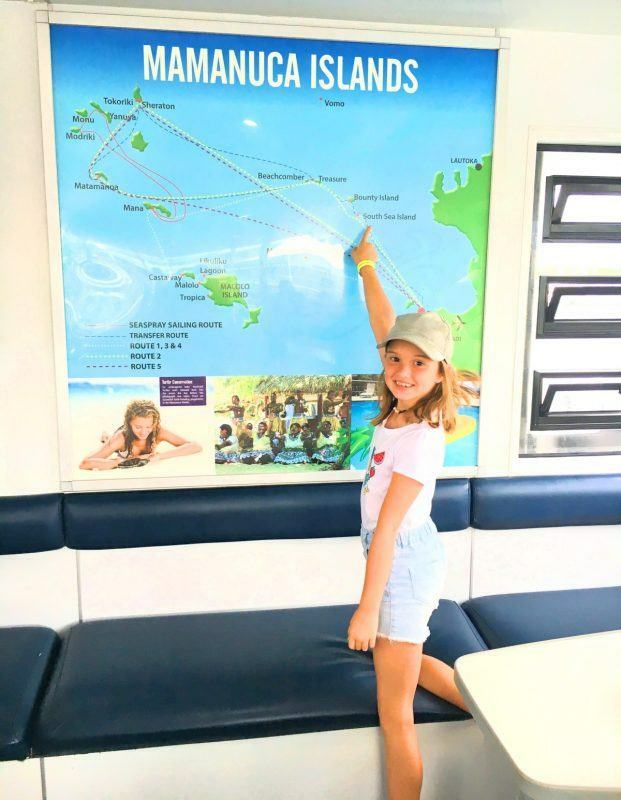 After a 30 minute ride back in the catamaran – which was big enough that we didn’t feel the effects of the waves and Sophie who is renowned for her motion sickness was fine – we reached Denarau Marina again. We were directed back to the bus that quickly took us back to our resort. 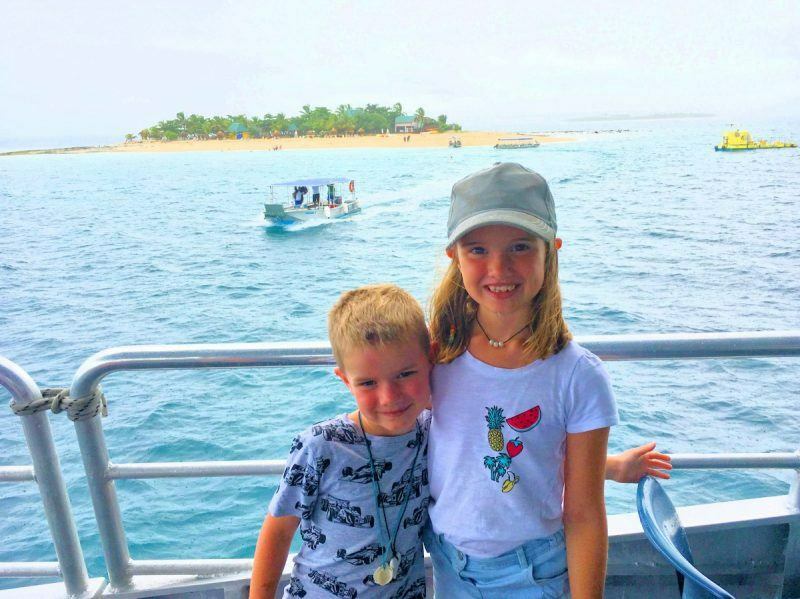 We really enjoyed our day out to South Sea Island and would highly recommend it as a fun day out for families in Fiji. 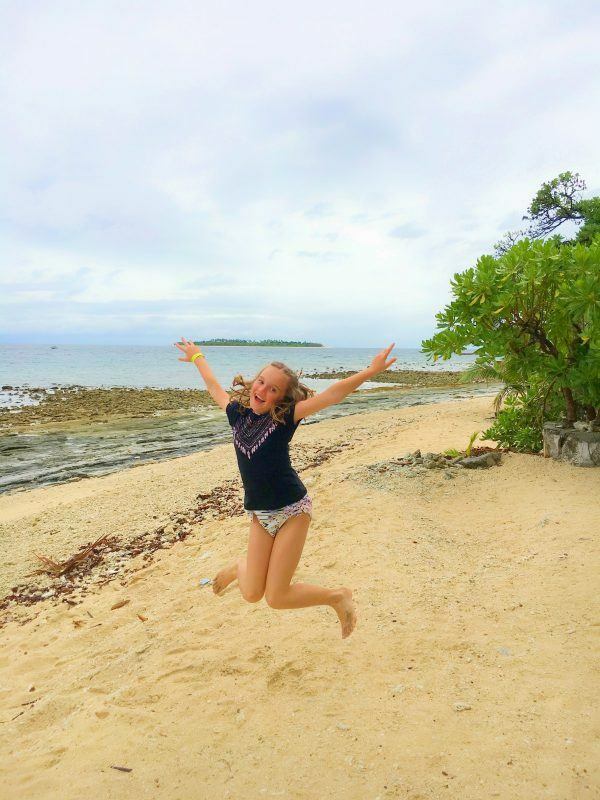 If you’re visiting in the rainy season like us, there is still plenty to do on the island, and it was fun swimming in the rain in the warm pool! 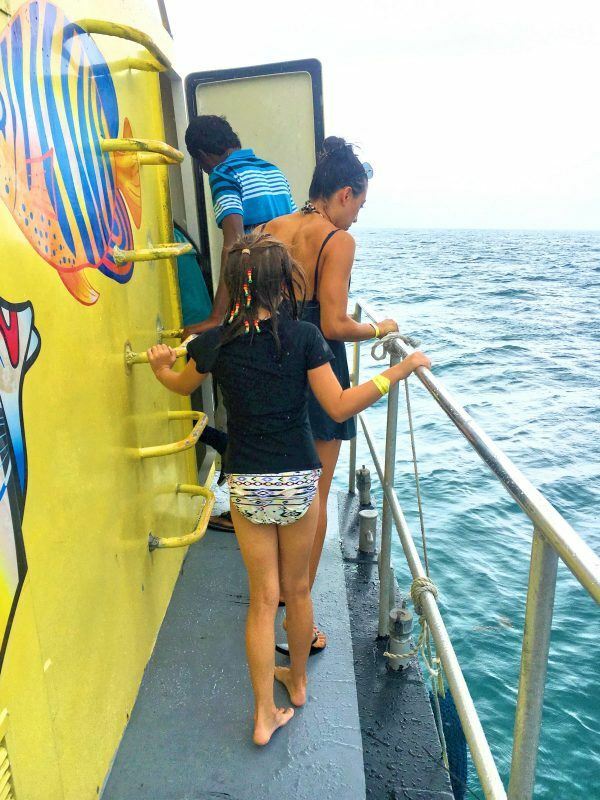 The crew and staff at South Sea Cruises are wonderful – we felt very safe at all times. The highlight for us was definitely the submarine adventure and the delicious food. 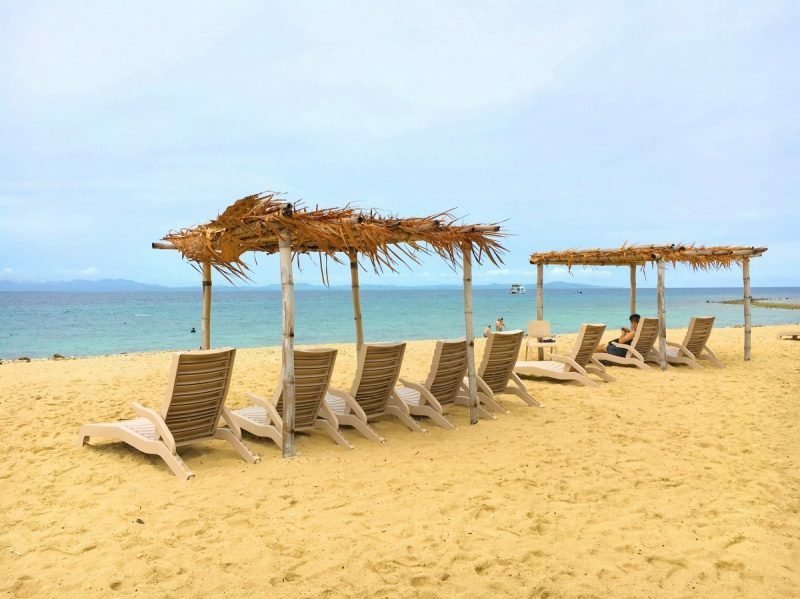 There are a few different options for South Sea Island. We did the Full Day Cruise which was fine for our kids aged 6 & 7, however a full day might be too long for younger families. 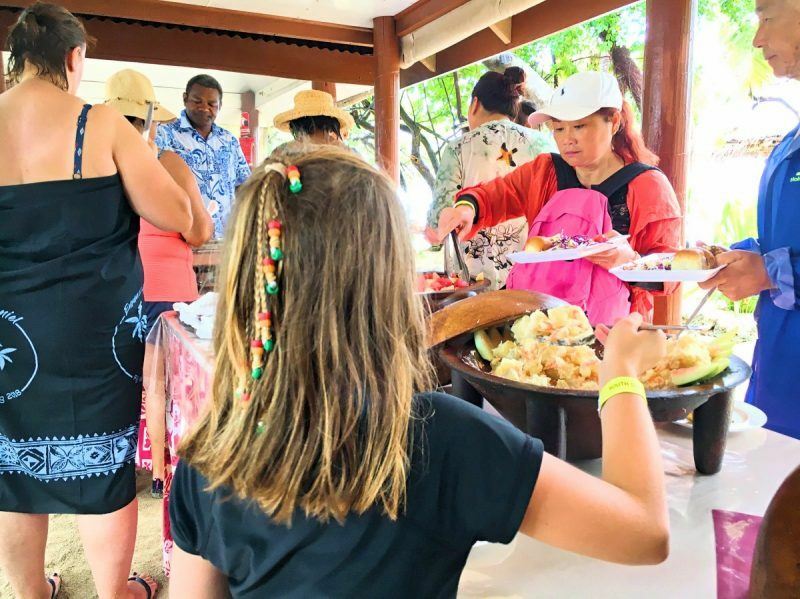 A great alternative would be the Half-Day Cruise (departs Denarau in the afternoon and includes lunch) or the Finding Nemo Cruise (morning only, doesn’t include lunch). -If you plan to walk around the island, explore the rockpools or go snorkelling, it’s a good idea to bring some reef shoes. There are sandy patches on the island but a lot of it is made up of coral and shells which can be sharp. 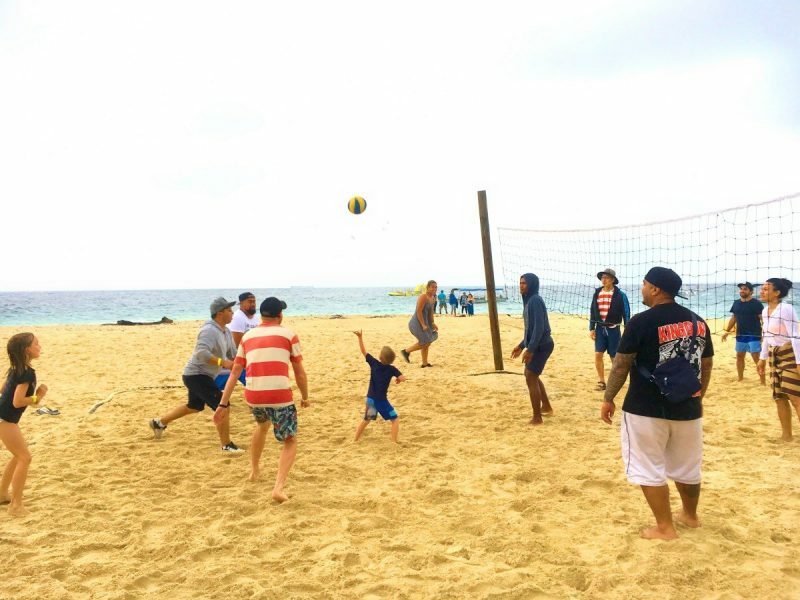 -Bring plenty of sunscreen and a good sunhat – the Fiji sun can be harsh! You also need to bring your own towel otherwise there is a charge for hiring one on the island. -The marine life and reef are really special, so think about bringing an underwater camera with you to capture it if you’re snorkelling. -If you suffer from motion sickness at all, you might want to think about bringing along some sea-sickness remedies. Check out our tried and tested motion sickness remedies recommendations here. Disclaimer: We were guests of South Sea Cruises, however as always all opinions are our own. 12 years ago I went island hopping in the Mamanuca Islanda with a friend! Treasure Island, Bounty Island and Beachcomber Island. 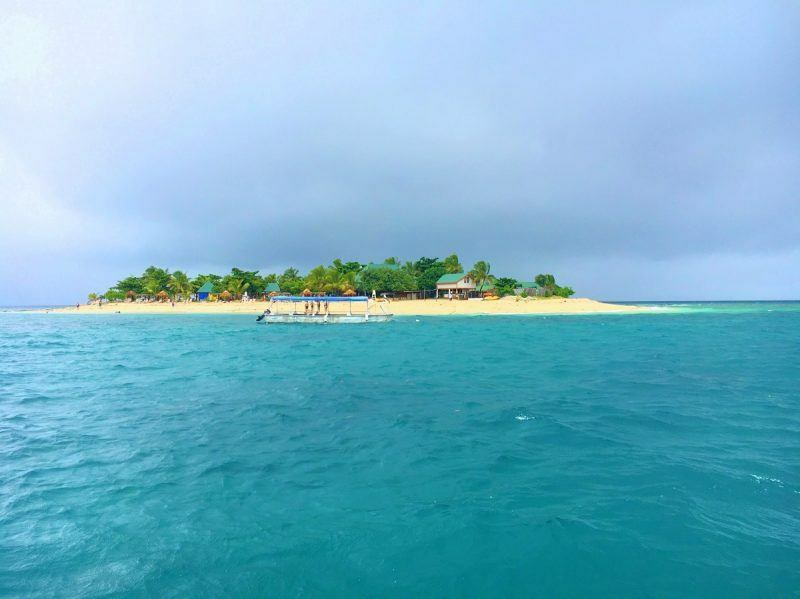 South Sea Island looks like a blast too – the cruise looks like an awesome day out. Thanks Sarah, yes it was a fabulous day out!